Congratulations to Rocco Palumbo, Winner of Event #44: $1,000 No-Limit Hold'em ($464,464)! After three hard-fought days of Texas Hold'em, Event #44: $1,000 No-Limit Hold'em is in the books with Rocco Palumbo standing tall as champion. Day 1 began with 2,949 entrants, which marked the second-biggest field thus far during this year's World Series of Poker. (The Senior's Event drew a record-setting field of 4,128). With a field this epic, you can be sure there was no lack of pros and notable names. Some who joined the action in Day 1 include Barry Shulman, Terrence Chan, Liv Boeree, Joe Cada, Jonathan Little, Jude Ainsworth, Ivan Demidov and Amnon Filippi. Of those players, several would go on to make a deep run in Day 2, but eventually fall short of the final table. Some names that were unable to survive into Day 3 include Cada (112th), Little (104th), Soi Nguyen (88th), Ainsworth (78th), Demidov (76th), Maya Antonius (65th) and Amnon Filippi, who busted in 62nd after coming into Day 2 as one of the chip leaders. 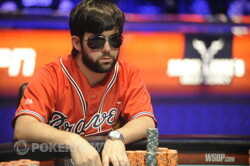 Blair Hinkle would also make deep run, but he fell short of the final table after busting out in 24th place. This would mark another deep run for Hinkle, who managed a 4th place finish just four days ago in Event 38: $1,500 No-Limit Hold'em. When Day 2 was all said and done, just 16 players remained to compete for the gold bracelet in Day 3. Among them included bracelet winner Keven Stammen, who won a bracelet back in 2009 and the last woman standing, Anke Berner - who came into day two with just 7,600 in chips. However, Berner managed to build her stack and survive into Day 3 tied for fourth in chips. When Day 3 began, the eliminations came swiftly and we reached our final table within just two levels of play. These early eliminations included Delis, Solokoff, Brar, Thomas, Azares and Stammen, who all fell just short of the final table. Shortly after the remaining ten players relocated to the main feature table, Darren Rabinowitz was eliminated when his pockets kings fell to Elia's ace-king after getting all in preflop. David Forster left our official final table first after getting into a preflop raising war with Palumbo. Forster ended up calling a Palumbo four-bet all in with , which was crushed by the of Palumbo. Forster couldn't pull the miracle and was sent to the rail in ninth place. Next to go would be Karschamroon after getting all in preflop with pocket eights against the queens of Everett. Karschamroom didn't improve and he was sent to the rail in eighth place. The sole-remaining lady, Anke Berner, was sent home next after pushing all in with and running into the of Niel Mittelman. The board failed to improve Berner's hand and she was sent eliminated in seventh place. Out in sixth place was Elia, who pushed his short stack into the middle from the big blind on a flop after calling a preflop raise from Palumbo. Palumbo snap-called with and eliminated Elia after he failed to improve. Everett hit the rail after running his into the of Robinson all-in preflop. Robinson was dominated and failed to get any help from the board - sending him home in fifth place. 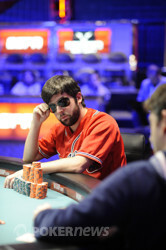 Mittelman made his exit in fourth place after getting into a preflop raising war against Robinson. After the smoke cleared, Mittelman was all in with against the pocket eights of Robinson. Mittelman bricked out and was sent home. Conway, who had not been involved in many pots during the final table, met his end after calling an all-in push from Palumbo with . Palumbo held the and the board kept Conway second best - sending him to the rail in third place. When heads-up play began, Palumbo enjoyed a slight chiplead over Robinson and quickly put his chips to work. Palumbo played aggressively to slowly whittle Robinson down to just over one million in chips. However, Robinson proved resilient as he doubled through Palumbo not once, but twice as a short stack. However, Palumbo would not be denied. Shortly after dinner break, Robinson and Palumbo would get into a preflop raising war. Robinson four-bet pushed all in with for his remaining stack and Palumbo called with . The board ran out and Palumbo claimed Robinsons' remaining chips with aces and fours. 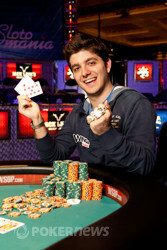 And just like that, Palumbo claimed his first WSOP gold bracelet and the $464,464 prize that went along with it! Be sure to check out our other coverage of the 2012 World Series of Poker, including the star-studded $50,000 Poker Players Championship, which is currently in its third day. That does for us here at Event 44: $1,000 No-Limit Hold'em. Until next time - goodnight from Vegas! Just a few hands after the dinner break and we have our champion. The last hand of the tournament began when Nelson Robinson opened the button to 120,000. Rocc Palumbo then asked how much Robinson had, before three-betting to 300,000. A few moments thought and Robinson would four-bet all in. Palumbo shrugged and made the call and the two players turned their hands over. Robinson was behind and in need of some help. The flop was the opposite of help and by the time the turn and the river had run out, it was all over for Robinson. For his effort, Robinson takes home $288,448 which is added to the almost $250,000 he won for finishing in 33rd place in last year's World Series of Poker Main Event. Nelson Robinson had the button when he raised it up. Rocco Palumbo called and the flop was dealt. Palumbo check-called a bet of 115,000 here and then both players checked the turn. On the river, Palumbo led for 170,000 and Robinson let go of his hand, sending the small pot to Palumbo. Rocco Palumbo opened to 120,000 and Nelson Robinson made the call from the big blind. The flop came and Robinson checked to Palumbo, who bet 110,000. Robinson called to see a turn, which came the . Robinson checked again and Palumbo fired 175,000. Robinson decided to give it up and slid his hand into the muck. Our two remaining combatants have taken their seats and cards are back in the air. Lets crown us a champion! Straight after the big all-in hand and the two players are heading on a shortened 30-minute dinner break. Here is how their chip stacks look. Nelson Robinson opened to 100,000 and Rocco Palumbo made the call. The flop came and Palumbo checked to Robinson, who fired another 100,000. Palumbo then check-raised to 220,000. Undeterred, Robinson pushed all in and Palumbo called to put him at risk. Robinson was in front with his ten kicker. The turn and river kept Robinson in front and he doubled through to 2.7 million. Rocco Palumbo had the button and raised it up to 100,000. Nelson Robinson made the call and a flop was dealt. Robinson led for 180,000 here and Palumbo called. On the turn, Robinson again led, this time for 325,000 and Palumbo called. The completed the board on the river and Robinson threw out a bet of 510,000. Palumbo didn't take long to go all in over the top and Robinson mucked even quicker, sending the big pot to Palumbo. A short-stacked Nelson Robinson pushed all in from the button and Rocco Palumbo called to put him at risk. The flop kept Palumbo in front, however a on the turn propelled Robinson into the lead with a pair of jacks. The river changed nothing and Robinson doubled through to 2.5 million. Rocco Palumbo was on the button when he raised it up to 100,000. Nelson Robinson three-bet to 250,000 and a flop was dealt. Both players checked here and then did the same on the turn. The river would see Robinson check and Palumbo bet 400,000. Robinson made the call and then mucked his hand when Palumbo tabled . The action has slowed and there have not been any large pots brewing. However, Rocco Palumbo continues to grind away at Nelson Robinson with preflop aggression and stabs on the flop and turn. Palumbo has an over three-to-one chip lead at this point. Nelson Robinson opened the button with a min-raise and Rocco Palumbo called. On the flop, both players checked and a landed on the turn. This time when Palumbo checked, Robinson bet 100,000. Palumbo then check-raised to 310,000 and Robinson quickly folded. Nelson Robinson opened to 100,000 and Rocco Palumbo three-bet to 275,000 from the big blind. Robinson called and the flop came . Palumbo fired 200,000 into the middle and Robinson called. However, when Palumbo fired again for 350,000 on the turn, Robinson gave it up and Palumbo scooped the pot. Nelson Robinson has been folding a lot the last few hands, with Rocco Palumbo picking up even more chips. There hasn't been any action past the flop, with Robinson folding to heat from the big-stacked Palumbo. Rocco Palumbo has seen his chip lead increase a little further as he has taken down another pot. This one started with Nelson Robinson opening the button to 100,000 and Palumbo three-betting to 275,000. Robinson called and a flop was spread on the felt. Palumbo led for 250,000 on the flop and Robinson called. On the turn, both players checked and the completed the board on the river. This time Palumbo led for 425,000 and after some thought, Robinson called. When Palumbo tabled his , the pocket pair was enough to see Robinson's cards into the muck. Rocco Palumbo opened to 85,000 and Nelson Robinson three-bet to 250,000 from the big. Palumbo flatted to see a flop, which came . Robinson led out for 225,000 and Palumbo raised it up to 575,000. Robinson quickly mucked and Palumbo scooped the pot. With the stacks around even, we have seen the preflop aggression amp up quite a bit during this last hand. It started with Rocco Palumbo opening the button to 85,000. Nelson Robinson then three-bet to 200,000. Palumbo quickly four-bet to 360,000 and it was back on Robinson. A five-bet to 690,000 and it was back on Palumbo. After a few moments thought, Palumbo six-bet all in. Robinson then snap-folded and Palumbo took down a bunch of chips. Rocco Palumbo opened to 85,000 and Nelson Robinson called from the big. The flop came and Robinson checked, prompting a 95,000 bet from Palumbo. Robinson then raised to to 245,000 and Palumbo made the call. Both players checked the turn, however, Robinson would fire out for 345,000 on the river. Palumbo called and Robinson flipped over for jacks and fours. Palumbo mucked and Robinson scooped the sizable pot to get nearly even in chips.